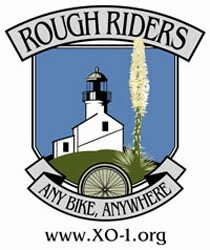 On November 21, 2009 ten Rough Riders embarked upon a semi-epic (borderline EPIC) excursion in the Santa Monica Mountains. 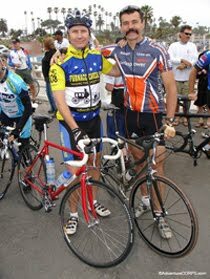 The ride leader was Chris Kostman. Six riders completed the full distance. It took eight hours to complete this route with a total distance of app. 45.7mi with 6110’ total elevation gain. 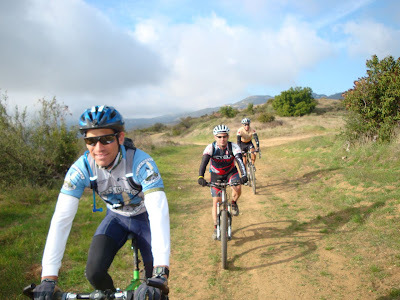 Above: Jim Swarzman in the Rough Riders jersey leads the group up Sullivan Canyon. We spent about one hour stopped for flat tyres (25mm road tyres, especially old, worn out ones, are not suitable for rides like this), and another hour was spent regrouping to make sure that riders did not get lost. About 30 minutes was also spent bush-wacking and way-finding on the Budwood Motorway. "Motorway" is more than a euphemism; this "fire road" quickly disintegrates into a barely rideable single-track and requires a lot of way-finding. This was the only part of the whole route which was new to the ride leader. Amazingly, he plans to ride this "Motorway" again (now that he knows what to expect and how to find the way. 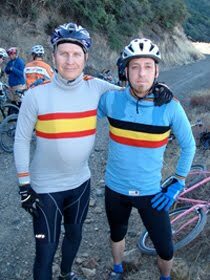 Special thanks to Calvin Mulder for leading us through this section.) This ride was the Full Version of the abbreviated version of this ride which we rode back on May 21. 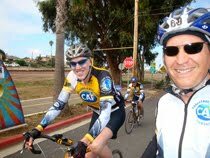 Click here for an awesome video slideshow of the ride, with music. Click here to see the same video on our YouTube channel. Click here for a traditional slideshow of the ride (same images as the video), along with this same ride report and route sheet. Ken Kistinger (Rivendell Rambouillet with fenders and road tyres), Errin Vasquez with Salsa Fargo, Simon Kann with Specialized Epic ATB, Jim Swarzman with K2 ZedM ATB, Stephen Bryne with Specialized Expedition with road tyres, Victor Cooper with Univega ATB, Ty Callahan with Sam Hillborne, Bruce Malm with Bleriot 650B with fenders and h'bar bag, Calvin Mulder with Felt cyclocross bike, and yours truly on my 1984 Holdsworth road bike with 32mm Ritchey cylclocross tyres. 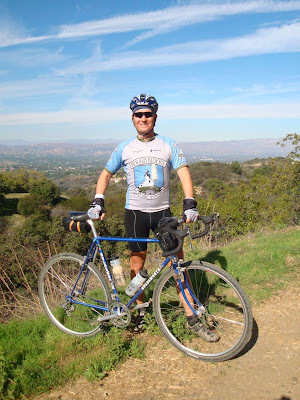 NOTE: Jim Swarzman was killed by a hit-and-run driver while riding a 600km Brevet on April 10, 2011. 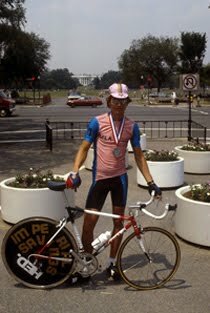 On April 11, 2011 I added a few more shots of Jim here, and then here is my post about Jim and that tragedy. Above and below: after The Hub, we headed towards Trippett Ranch. Above: On the Summit to Summit Motorway. with "The Valley" behind. Above: the not-to-be-missed rocky promontory on Calabasas Peak Motorway with view of Stunt Road and Saddle Peak in the background of this shot. Above: almost the same location as the previous shot, but with "The Valley" behind. 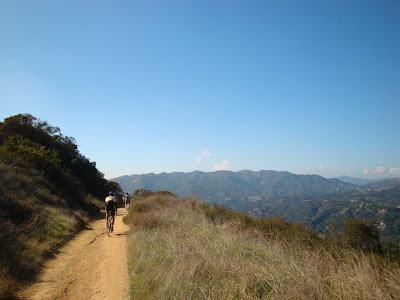 Above: Heading down, so we can climb up Stunt Road to Saddle Peak in the distance. 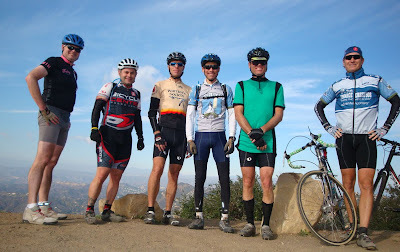 Above: atop Saddle Peak, after climbing Stunt Road. Above: our Budwood Motorway will turn into a bush-wack quickly! Jim Swarzman leads. Above: Budwood starts off great, but deteriorates as it descends towards the coast. Note how high above the cost we are! 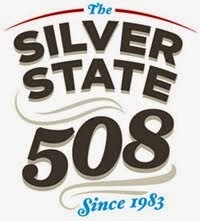 Amazingly, we will be there in about three miles. Above: Jim Swarzman hike-a-bikes part of the way down to the coast. Above: Mission accomplished! 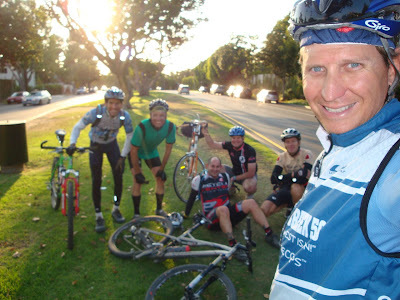 Chris Kostman self-portrait with the other five Rough Riders - Jim Swarzman, Stephen Bryne, Simon Kann, Ken Kistinger, and Calvin Mulder - who completed the whole enchilada! 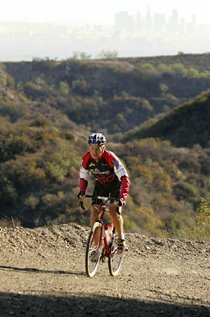 NOTE: All of these trails and roads can be found in the Thomas Bros. Guide for Los Angeles on pages 591, 590, 589, and 629 (in that order). Also note: this route sheet is not entirely accurate, it requires navigation, and no guarantees are made about the legality or safety of the route! RIDE AT YOUR OWN RISK! • Start: 26th and San Vicente, Brentwood Santa Monica, CA 90049. 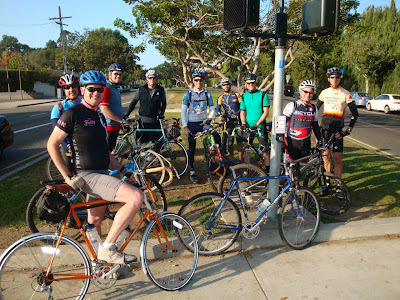 Go north on 26th AKA Allenford Ave.
• Take streets - Sunset Blvd (R), Mandeville Canyon (L at 1.1mi), Chalon (L), Queensferry (R at 3.6mi) to enter the bottom of Sullivan Canyon. 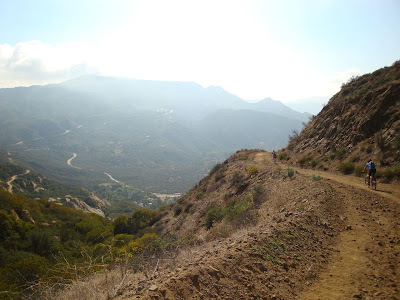 • Ascend Sullivan Canyon (AKA Farmers Fire Road on maps) to Sullivan Ridge. • Left/West on Dirt Mulholland: go 2.7mi. • Left on Temescal Fire Road south to "The Hub". 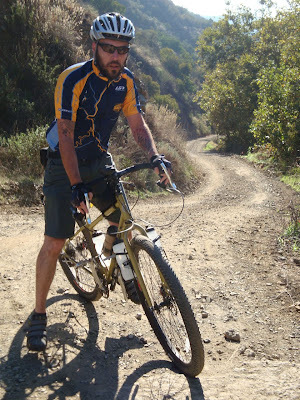 • At The Hub (13.4mi / 2450’ elevation gain): Hard Right on Topanga Fire Road towards Trippett Ranch. 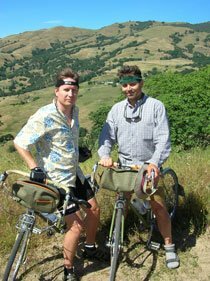 • Right down into Trippet Ranch (16.3): state park parking lot area with water and restroom. • Take Entranda Rd. (paved) down to Topanga Canyon Blvd. 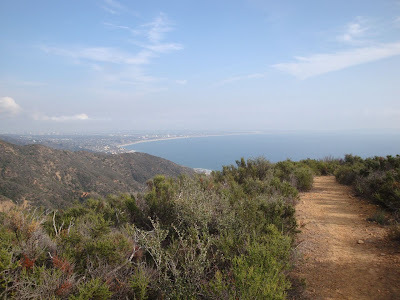 • Go south briefly on Topanga Canyon Blvd (17.7mi). 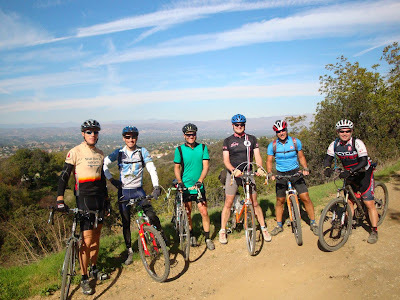 • Right on Topanga School Rd (17.8mi) to end and through the cul-de-sac / front of the school. - On weekends, there is gate which needs to be surmounted (18.0mi). • Enter the south end of Henry Ridge Motorway (18.05mi: at very small, yellow State Park sign: uphill, very steep, overgrown dirt “road” to right of water tank). 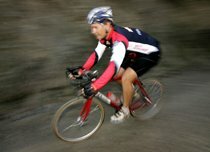 • Continue / left on Henry Ridge Motorway proper (18.4mi: paved road, uphill). - Just stay on this, northbound, along the ridge. You’ll pass through some gates, mostly open. 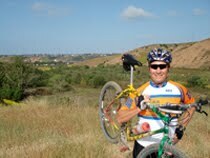 • Left / West on Summit to Summit Motorway (20.5 / 3690’ elevation gain). - This is paved for just 50 feet, then turns to dirt at chain across road. Not well signed. • Cross the summit of Old Topanga (paved) Road (22.1 mi / 3790’ elevation gain). - Go straight across, go along left driveway, and follow "Trail" signs onto steep singletrack. 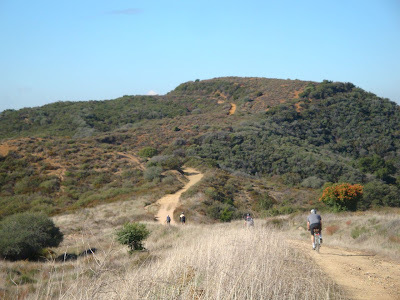 • Continue left / south on Calabasas Peak Motorway (22.3mi: a dirt fire road). 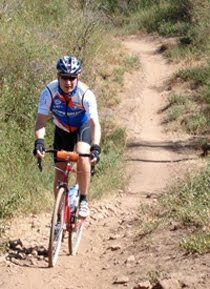 • At 24.1mi, veer left off fire road, park bike, and scramble up onto rocky promontory to see view of Stunt Rd. (4510’ elevation gain) and Saddle Peak. Then continue as you were. • Continue straight / right at 25.1mi or follow Option Two as below. 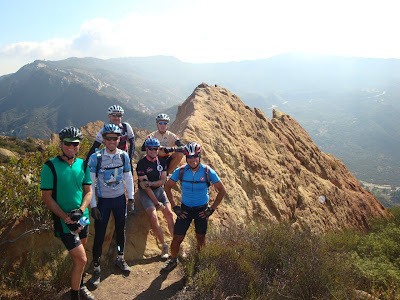 • Drop onto Stunt Road, go left to climb Stunt to Saddle Peak (25.7mi / 4550’ elevation gain). • At 28.2: Mile Marker 3.61 / Address 335: Water Fountain on Right at Driveway (5500’ elevation gain)!!! 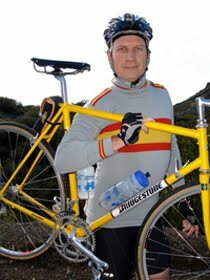 • Left at the top of Stunt on Saddle Peak Rd (28.7mi / 5650’ elevation gain). 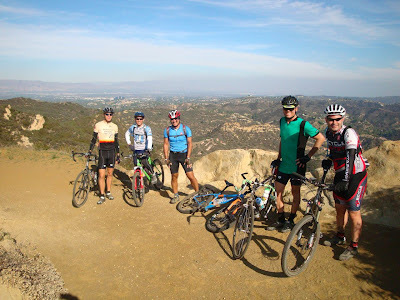 • Right on Tuna Canyon (31.9mi / 5770’ elevation gain). 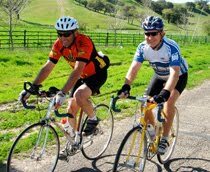 • At 33.0mi, go Right onto gated fire road as paved road swings left after a short fast downhill. 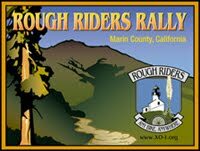 • At 33.1mi, go Right on Big Rock Motorway (fire road). • At 33.35mi, Left (very soon) on Budwood Motorway (fire road). Stay on this all the way to coast, but this will require a lot of bush-wacking and way-finding. However it is epic! Some bike pushing/hauling required. • At 36.7 (app), gate at the end of the trail / fire road. Civilization! • Left on Big Rock Drive (paved road) (36.9mi). 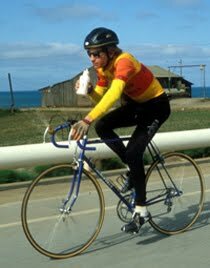 • Left at the bottom onto PCH (37.3mi). 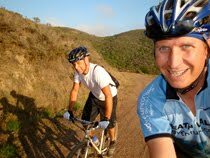 • Enter southbound beach bike path at Temscal Canyon Rd. • Go under PCH at 42.8mi via stairs and pedestrian tunnel. This is equivalent to going left on West Channel from PCH into Pacific Palisades. • As you exist the pedestrian tunnel, go straight up Ocean Avenue (head inland). • Immediate Right on Short Drive (42.9mi), then immediate left on Entrada Drive. • Immediate right on Ocean Way (43.0mi), then follow that left onto Mayberry. • Right on Ocean Avenue (43.4mi). • Left on San Vicente (44.7mi). • Arrive back at 26th Avenue start/finish (app. 45.7mi with 6110’ total elevation gain). • Go left at the fork onto Red Rock Road, instead of continuing down to Stunt Rd. • Turn left on PCH back to Brentwood via West Channel, etc as above. 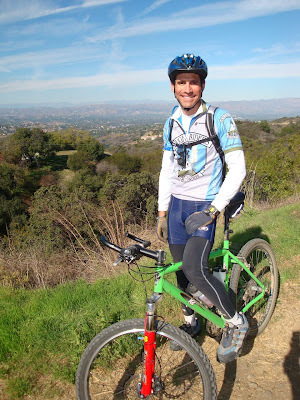 It was a terrific ride, with varied terrain, and amazing views. Budwood "Motorway" got the best of me when I managed a head-bounce, bodyslam that left me a bit beat-up. When we were kinda lost on the ridge between Tuna Cyn and Big Rock with no real trail to follow, Chris was the epitome of a "fearless leader", and Calvin was an awesome scout. 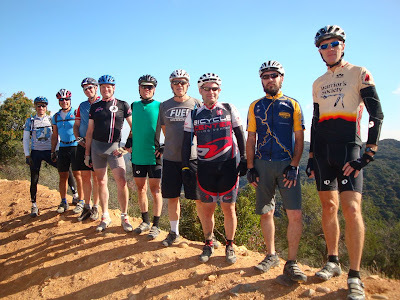 All in all, a great day, and some great guys to ride with. Nice write up and great shots! I love riding up there. Brandy invited me to join on this but I was too chicken as you guys are way way beyond my level. 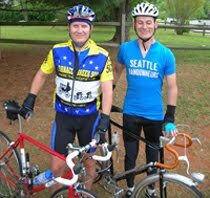 Thanks for sharing the post ride report. My friend Vic had a great time, I heard. I finally tried this ride today and unfortunately was stopped at the gate mentioned at Topanga Elementary. I couldn't find anyway over or around the gate, nor could the nice resident who lives next to the school. For those who'd rather not take chances on the gate simply turn Right at Topanga Cyn and two Lefts on Greenleaf and Gold Stone which deposits you onto the Henry Ridge Motorway. As always, thanks for posting the route!